2016 Bonny Doon Vineyard, Picpoul “Beeswax Vineyard” Arroyo Seco, Monterey County. Randall Grahm’s racy crisp Picpoul from Arroyo Seco is a smashing good little white wine with lots of class and character showing stony/mineral expressiveness and vibrant fruit, this is really tasty treat. Picpoul, best known for the single varietal Picpoul de Pinet a classic dry summer fresh wine of the Rhone Valley, is also one of the Chateauneuf-du-Pape grapes, first thought to have come or brought to California by Tablas Creek in Paso Robles from cuttings from Chateau de Beaucastel, Randall uses it in his Rhone style Le Cigare as well, a wine that pays homage to the wines of Chateauneuf-du-Pape. As a single varietal, in this wine, the Bonny Doon Picpoul delivers bright detail and vitality with zesty citrus, round white peach, light tropical notes and wet chalk with a core of lime and honeydew melon along with white flowers and spice. This light to medium bodied white is refreshing and entertaining, in my opinion it offers a lot of flavor and energy for the money, much more enjoyable than the sea of dull and flat Sauvignon Blancs or the cloyingly sweet Pinot Grigios that seem to be taking up majority of shelf space in the alternative white wine section of most wine shops in California these days. This is fun stuff, Bonny Doon has been re-energized in recent years and Randall continues to challenge our palates and minds with some thrilling wines, besides this one, you should search out his set of pink wines, including his extended car-boy aged Le Cigare Vin Gris Reserve, which is a thrilling and engaging Rose, and his Grenache “The Wine Formally known as Clos de Gilroy” Monterey County, in particular the 2015, a killer wine under $20. 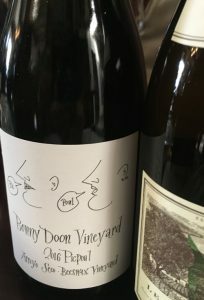 Certainly if you want something different, Bonny Doon Vineyard, is a great option and this 2016 Picpoul Beeswax Vineyard is impressive, with air it gains and a subtle richness, a superb summer choice and a wine that will go righteously with seafood, especially south of France inspired bouillabaisse and or picnic fare, drink now.